Come February 12 through 14, it will have been 40 years since I caught this miniseries, “King”, on NBC as a college senior. It was to be a formative experience, not so much because of it’s treatment (which was certainly very positive and inspiring at times) , but because of how it launched me on a years long quest to find out more about MLK, which further awakened in me a sensitivity to the vision for justice in our Christian tradition (to add to experiences of being exposed to Clarence Jordan —post mortem— and a visit to Koinonia Farm with a group from my Church youth group in 1974, and my introduction, in 1976, to the history of the Church of the Saviour in Washington DC through the writings of Elizabeth O’Connor). 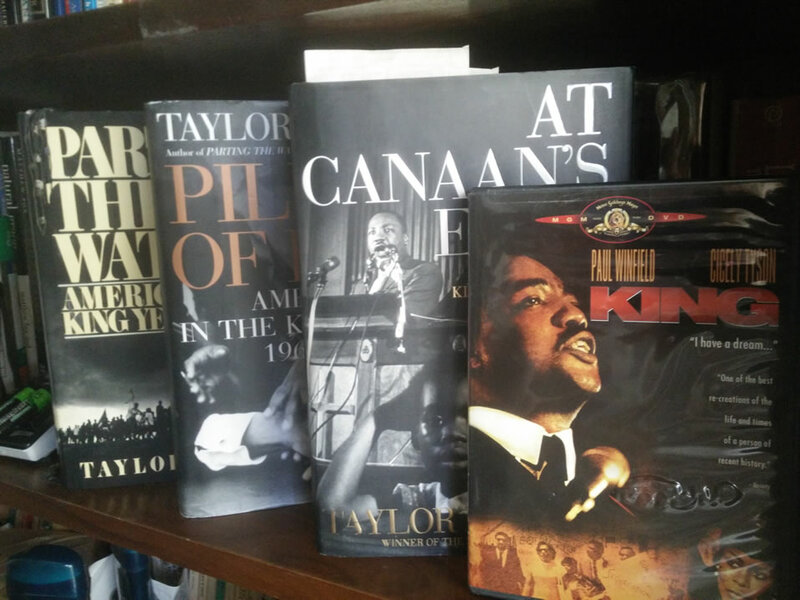 I was to later do my research paper for my “Law and Society” course as a Sociology major on “Martin Luther King, Jr. and Civil Disobedience”, and one in Seminary for Baptist History on “The Southern Baptist Response to Martin Luther King, Jr.” I also viewed as many documentaries as I could about MLK, and have several books by him and about him , including the massive 3 volume history of “America in the King Years” by Taylor Branch. And, of course, now I have the DVD of the series. Having begun with my own church experience with a very formative experience that included exposure to Clarence Jordan and Church of the Savior, both very much involved in justice ministries, which led me to have my theological interest sparked by the “King” miniseries in 1978, and then starting Seminary that fall, in 1978, I feel that my own theological journeyis largely shaped by MLK’s life and history. And now, as I focus on the church in an Ecological Crisis, I feel that MLK’s own insitincts would have led him to this as a very pivotal justice issue in his own work, as he was expanding his work into economic justice issues through the Poor People’s Campaign (and the March which was to be the kickoff). King had long been making the “Connections” to “Cosmic Inter-connectedness of ALL LIFE” which would have been a natural theological sugue into bringing this prophetic word to a fossil-fuel dominated economy that was wreaking havoc on the country’s poor and indigenous people around the world. I owe it to Drew Dellinger and his work on “The Ecological MLK” for bringing to light this further impact of Dr. King on my life, as I now, in a year that has seen the 500th birthday of the Protestant Reformation, seek to help bring about an Eco-Reformation in the Church. This entry was posted in Ecological Economics, ecotheology, Occupy Theology, OWS, People's Climate by Theoblogical. Bookmark the permalink. It makes me nauseous to hear people give faint praise for the “sanitized” King. I know it is faint because I hear them forwarding arguments against which King fought all his life. I also have a pretty good idea that they would likely be right there with the forces of reactionary status-quoism, resisting integration and calling King out for his “lack of respect for the law”. I see it in UMC News Service Facebook posts linking to articles about churches providing sanctuary for people in danger of being deported by the Trump/Sessions ICE goons. The forces of the conservative idea of status quo are alive and well.